Menya Musashi Takatora (Noodle House Musashi Hawk and Tiger) is a part of a highly regarded local chain. I think the original is in Shinjuku, but there are 5 or 6 around the city, each designated with a slightly different name (hence the "Hawk and Tiger"). I don't know the full story behind Musashi, but all of the branches are very popular, and apparently the honten can get lines to rival Jirô's. The Takadanobaba branch is just across the street from the main entrance to the JR station, tucked away in a small alley. There was a line about 5 people deep when I came in, but not stretching out the door. In any case, I got a seat in a few minutes and my noodles a few minutes after that. Takatora is somewhere between your standard ramen shop and one of the new fangled fashionable places in terms of appearance and atmosphere. Straightforward and simple in design, but with black walls, pretty soup bowls, and a better than average bathroom. The big drawing point here is the shôyû blended fish broth soup, with niboshi (dried sardines), konbu seaweed and possibly other fish stock mixed in to a more standard ramen broth to create a wafû (Japanese style) soup. This was one of my first experiences with niboshi broth, and I thought it was so-so. A bit fishy for me, and not quite my taste, but certainly a very flavorful soup. As a nice bonus, the cook gave me a free boiled egg (ajitama) since I asked for no pork. 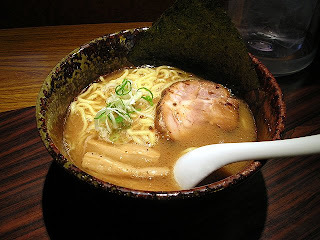 The broth is a dark brown color, with better than average nori, menma (bamboo), and onions. The tsukemen also seemed to be exceptionally popular among the rest of the customers. One nice feature is that at least at lunch, all size of noodles are the same price. I'm glad I went to Takatora to taste what all the fuss is about, but I don't think I'll be going back. I would recommend this shop highly to anyone who is a fan of blended fish broth ramen, but that's just not me.